I am deeply grateful to all Nigerians - Muslims and Christians alike who have prayed and are continuing to pray for my good health. This is a testimony that in spite of the hardship being experienced, Nigerians support the Government in its effort to tackle our country's challenges. The best way for me to repay you all is to re-dedicate myself to serving you, protecting your interests and keeping your trust. I thank you very much. I am feeling much better now, there may, however, be need to have further follow-ups within some weeks. Rather than sending delegation upon delegation to Abuja to welcome me, may I appeal to all Nigerians to continue to pray for our country's unity, progress and prosperity. I thank you very much and may God bless our Country! 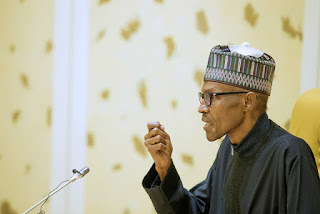 0 Response to "See How President Buhari Addressed The Nation After He Returned From UK"